Ben Yoder was looking forward to May 4th. That was the day of Run for the Hills annual fun run, where students at Forest Hills Lutheran School in Cornelius, Ore., run as many laps as possible around the school’s track. It’s not so much a track as a bumpy, cracked and oblong asphalt walking path. The path is used every day by kindergarten to eight grade students during PE classes or running club. Someone always falls. There’s been skinned knees, scuffed hands and bruised elbows. One student even broke an arm. Up to this point, Yoder, a third grader, had been spared of any falls or injuries. Perhaps his luck would hold out this day. His goal was to run eleven times around the track—a personal record. He was four laps in when, coming around the curve on the north end that dips, Yoder tripped and skinned his knees. Unfortunately, he was unable to continue. The school has wanted to replace the track for years, “but it was way out of our budget,” said Carla Beyer, athletic director at Forest Hills. It still is. Thus, the idea has stayed on the shelf. That is, until last year when some students decided to take on the challenge. It’s not an uncommon question coming from a seventh grader. It’s also the type of question that Schiemann is primed to answer. He is a big believer in practical application and saw the opportunity with Smith’s question. The next day, he arranged to have his math students meet at the walking path. He then proceeded to explain how math, like geometry, is used to survey, design and build a running track. The students started talking. They talked about the condition of the path. They talked about the injuries. They wondered what it would take to replace the path with an official running track. More importantly, they wondered what it would be like to leave a legacy to the up and coming students—and they dreamed of graduating on that very track. The time line is tight. The students are now in eight grade and the entire process—from land-use approval to construction—takes about six to eight months (if the weather cooperates). Fortunately, things are falling into place. For instance, one of the student’s father works as an engineer with Washington County. He suggested the students approach a local civil engineer and community planning firm, 3J Consulting, to draw up blueprints. After reviewing the project, the firm agreed to do the project pro bono, a value of about $50,000. The students have been involved in every step of the process. In addition to what they learned through 3J, the students also learned how to apply for grants, approach philanthropists and speak in front of a committee. Another practical reason for replacing the walking path with a formal running track involves the school’s running team. In order to train, they had to travel 30 minutes to a local Catholic school with a beautiful track. Recently, however, they’ve lost the ability to use it. Practicing field events like the shot put are limited as well. The project will occur in three phases. 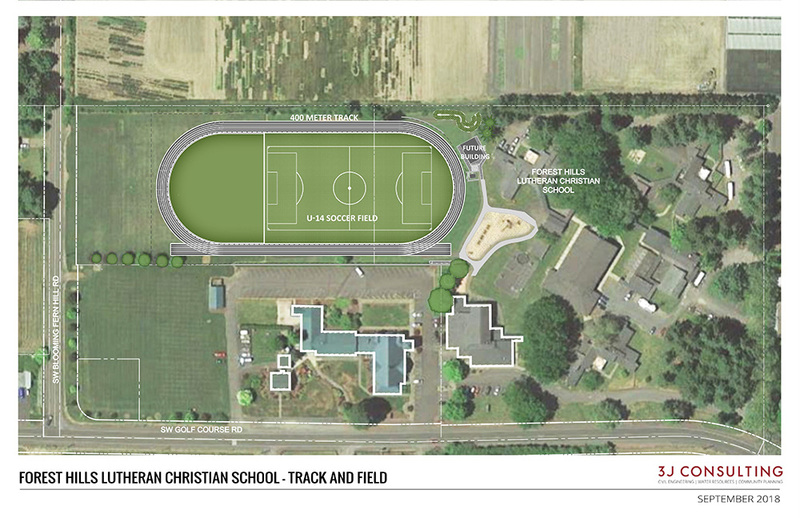 The first phase of the project will include an eight-lane paved oval track. The second phase would involve putting a turf soccer field inside the track. And the third phase would be the construction of a building on the west side of the track to provide a concession stand, water fountains, storage and restrooms. The total project is estimated at $1.2 million. Estimate for phase one is $400,000. How close are they to funding the first phase? About $10,000, a long way off from their goal, yet funding is the only thing hindering them from moving forward. While the academic curriculum includes all traditional elementary and middle school subjects and a formal Christian studies program based on God’s Word, it’s things like the track project that make Forest Hills unique. Its location makes it ideal as well. Forest Hills lies about 40 minutes west of Portland along a two-lane road that winds its way over rolling hills and through vineyards. The school grounds are more like a college campus. Massive pines tower over the spread-out buildings. Each building is connected by sidewalks covered with wooden roofs (it rains often in Oregon). On a clear day, students are found outdoors as much as indoors. Third graders testing their sun dials while others learn how to dribble a soccer ball. Mt. Hood—Oregon’s tallest peak at 11,249 feet—is visible in the east. 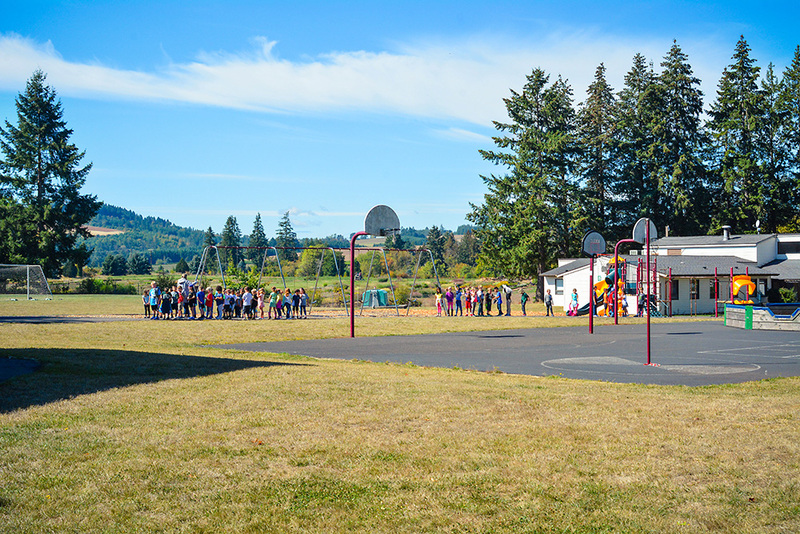 Established in 1989, the school is owned and operated by an eight-church association, including Trinity Lutheran Church, Hillsboro, and Prince of Peace, Forest Grove. Ninety-four students enrolled in the first year. That number grew to 200 in seven years. Then there was a decline, before the numbers started to climb. Through the years, Lutheran Church Extension Fund (LCEF) has enjoyed the privilege to support Forest Hills. A SMART loan allowed the school to revamp one of their buildings into a more modern unit. The school mounted a larger, more visible sign through LCEF’s signature series program. With God’s blessings and the prayers and support of people like LCEF investors, Forest Hills is finding unique opportunities to share the healing love of Christ with Portland communities. Join us as we pray for Forest Hills, principal Mike Schiemann and the eight-grade math class to be salt and light—today and in the future.